or absorbed through the skin. Caffeine is a chemical compound that is made by plants. Caffeine is classified as a methylxanthine alkaloid. It is a central nervous system stimulant. In its pure form, it is a white powder that is odorless with a slightly bitter taste. At present there are 63 different species of plants known to contain caffeine (Phytomedical Technologies 2006). Historically, the most common food sources of caffeine in the human diet have been coffee (from the coffee plant, Coffea sp. ), tea (from the tea plant, Camellia sinensis), and chocolate (from the cacao plant, Theobroma cacao). Some less common sources of caffeine are cassine (Ilex vomitoria), yoco (Paullinia yoco), mate' (from yerba mate, Ilex paraguariensis), and guaraná (Paullinia cupana) (Hill 1952). Today, beverages containing added caffeine—such as colas and energy drinks—enjoy popularity great enough to make caffeine the world's most widely consumed psychoactive drug. Global consumption of caffeine is estimated to be 76 milligrams (mg) per person per day. In the United States, the average is 238 mg per person per day (RSNA 2005). Because of its stimulant quality, many people consider caffeine to have a beneficial impact on their lives, including greater mental alertness, faster flow of thought, improved focus, and better coordination. It has even been used by the Sufis as a spiritual aid, to help with their prayers. However, if caffeine is to be consumed, self-discipline and moderation are also required. While this drug has been considered safe if used in moderate amounts, overconsumption has been tied to such deleterious symptoms as nervousness, insomnia, and jitteriness, and long-term effects of prolonged, repeated use can include risk of stomach ulcers, dependency, and withdrawal symptoms (such as headache, irritability, tiredness, and depression). In nature, caffeine is found in varying concentrations along with other xanthine alkaloids such as theophylline and theobromine, which are also stimulants. The world's primary source of caffeine is the coffee bean (the seed of the coffee plant), from which coffee is brewed. There are many species of the genus Coffea whose caffeine content varies widely. There are many factors affecting the caffeine content of a cup of coffee including the type of bean, the roasting method, and the method of preparation used, but in general, one 8 oz. serving of coffee has about 100 milligrams (mg) of caffeine. Darker roasts of coffee have less caffeine than lighter roasts, since the roasting process reduces the caffeine content of the bean. Arabica coffee beans average 24 mg/gram (g) of caffeine whereas the Robusta variety averages 13 mg/g (Casal et al. 2000). Tea, another common source of caffeine, is produced by brewing leaves of the tea plant (Camellia sinensis), which has hundreds of varieties. The amount of oxidation that the plucked leaf undergoes determines whether it is classified as white, green, oolong, or black; where white has the least amount of oxidation of the leaf and black tea has the most. More oxidation results in higher levels of caffeine. In black tea, caffeine was found to be 25 mg/g of tea leaf, whereas in green tea the caffeine level was 15 mg/g of leaf (Khokhar et al. 2002). Often considered one of the most delicious sources of caffeine is chocolate. This is obtained from the seeds of the cacao plant, Theobroma cacao. These seeds are processed to make cocoa, chocolate, and cocoa butter. Cacao seeds have only a small amount of caffeine, with 2.5 mg/g. A typical serving of a milk chocolate bar (28 g) has about 20 mg of caffeine. Cola (kola) nuts are a natural source of caffeine that were once used as the sole source of caffeine in the first Coca-Cola beverages. There are about 40 species of the cola plant, with Cola nitida, and C.acuminata being the most common commercial species. Cola nuts contain up to 25 mg of caffeine per gram. Yerba mate' (Ilex paraguensis) is a tree that grows in South America; its leaves are used to make a caffeine-containing tea. The flavor and aroma of the leaves of the wild trees are considered by some to be much better than the cultivated ones. The level of caffeine in the leaves is about 20 mg/g. Most modern soft drinks that contain caffeine rely on purified caffeine as the sole source. Some sports or energy drinks have very high levels of this stimulant. Red Bull has about 100 mg of caffeine per serving. Soft drinks like Coca-Cola contain 23 mg per 8oz (Coca Cola 2006) and Pepsi One contains 36 mg per 8oz (Pepsi 2005). The U.S. Food and Drug Administration (FDA) allows caffeine to be added to cola-type beverages up to 0.02 percent and it must appear on the label as an ingredient. The European Union requires that a warning be placed on the packaging of any food whose caffeine content exceeds 150 mg per liter. Coffee plants are probably indigenous to the Ethiopian region, and were introduced into Arabia and the rest of the East by the fourth century (Best 2006). In the mid-fifteenth century, the Sufis of Yemen used coffee to stay awake during prayers. In the sixteenth century, there were coffee houses in Istanbul, Cairo, and Mecca, and in the mid-seventeenth century coffee houses opened in Europe. Tea has been consumed in China for thousands of years, where it has been purported to have been discovered by the Chinese emperor Shen Nung in 2737 B.C.E. Traditional stories tell that monks drank tea to stay awake during meditation practice. Guarana' and yerba mate' are plants indigenous to South America and it is presumed that the use of both of these plants by ancient peoples such as the Guarani tribesmen, from whom the guarana plant was named, started before any recorded history of this area. Cola nuts are indigenous to West Africa and have been chewed by local people possibly for thousands of years. Cola has been traded to other countries as a valuable commodity since probably before the fourteenth century. The nuts have been used as a stimulant by African Islamic people who use them instead of alcohol, which is forbidden. Cacao in the form of a chocolate beverage has been traced to the early Maya about 2,600 years ago. In 1519 Hernando Cortes entered Mexico and reported that cocoa was being consumed in large quantities by the Aztec leader Montezuma. In 1821 relatively pure caffeine was isolated for the first time by the German chemist Friedlieb Ferdinand Runge. According to legend, he did this at the instigation of Johann Wolfgang von Goethe (Weinberg and Bealer 2001). He called this substance kafein, which means "something found in coffee." Caffeine was not synthesized until 61 years later in 1882, by the German chemist and Nobel laureate Emil Fischer (Merck Index 2001). Purified caffeine powder can be synthesized from a variety of starting materials, such as urea, xanthine, theophylline, and theobromine. The high demand for decaffeinated products has resulted in an abundant supply of caffeine washes extracted from coffee and tea. The relative ease of purification of caffeine from these decaffeination liquids makes synthesis much more expensive by comparison. Today, most caffeine powder is derived from these natural extracts. Caffeine extraction is an important industrial process and can be performed using a number of different solvents. Benzene, chloroform, trichloroethylene, and dichloromethane have all been used over the years, but for reasons of safety, environmental impact, cost and flavor, they have been superseded by two main methods: water and carbon dioxide. In the water method, green coffee beans are soaked in water. The water extract, which contains not only caffeine but also many flavor compounds, is then passed through activated charcoal, which removes the caffeine. The water can then be put back with the beans and evaporated dry, leaving decaffeinated coffee with a good flavor. Coffee manufacturers recover the caffeine and resell it for use in soft drinks and medicines. Supercritical carbon dioxide is a good solvent for caffeine extraction that is less toxic than the organic solvents that have been used in the past. The extraction process is simple: CO2 is forced through the green coffee beans at temperatures above 31.1 °C and pressures above 73 atmospheres. Under these conditions, CO2 is said to be in a "supercritical" state: it has gas-like properties which allow it to penetrate deep into the beans, but also liquid-like properties that dissolve 97-99 percent of the caffeine. The caffeine-laden CO2 is then sprayed with high pressure water to remove the caffeine. The caffeine can then be isolated by activated carbon or by other standard methods. Caffeine has a significant effect on spiders, which is reflected in their web construction. Caffeine is a central nervous system stimulant, and is used to increase mental alertness when drowsiness occurs. It can produce faster flow of thought, improved focus, and better coordination. The one physiological function that is most sensitive to caffeine is the sleep-wakefulness cycle, which is presumed to be controlled by the following brain areas: locus ceruleus, raphe nuclei, and the reticular formation. Caffeine will prolong the onset of sleep (latency) and shorten its duration. Caffeine causes an increase in blood flow to the kidneys and an increase in the production of urine. It also decreases the tubular reabsorption of sodium and water, resulting in more dilute urine. In the brain, caffeine causes blood vessels to constrict, but among the peripheral blood vessels, caffeine causes dilation. Caffeine causes a brief increase in the following: heart rate, cardiac output, and the force of contraction. At doses greater than 250 mg, it may cause extra beats, rapid heart rate (tachycardia), and/or major ventricular arrhythmias (Drug Facts Comparisons 2001). Several studies have shown that caffeine causes increased systolic and diastolic blood pressure as well as skin temperature in a definite dose-dependent relationship (Chawla et al. 2006). Caffeine stimulates skeletal muscle by increasing the strength of contraction and decreasing fatigue. It also stimulates the breakdown of glycogen and lipids to enhance endurance. In subjects who have a limited history of caffeine use, this drug will cause an increase in plasma levels of epinephrine (adrenalin), norepinephrine (noradrenalin,) and renin, which activates the angiotensinogen/angiotensin cascade to increase blood pressure. Caffeine causes an increase in turnover of some neurotransmitters in the brain, such as acetylcholine and the monoamines (norepinephrine and domamine). It also potentates the effect of certain dopamine-releasing (dopaminergic) cells in the prefrontal cortex. However, unlike typical drugs of abuse, caffeine does not affect dopamine release in the nucleus accumbens. Caffeine is sometimes administered in combination with analgesics to increase their effectiveness, such as with ergotamine in the treatment of migraine and cluster headaches, or with certain pain relievers such as aspirin and acetaminophen. Caffeine may also be used to overcome the drowsiness caused by antihistamines. Cessation of breathing (apnea) in premature infants is sometimes treated with citrated caffeine, which is available only by prescription in many countries. When taken in excess, caffeine use has been correlated to nervousness, insomnia, jitteriness, and reduced depth of sleep (Hoeger, Turner and Hafen 2002). Long term effects of prolonged repeated use can include risk of stomach ulcers, dependence, and withdrawal symptoms (headache, irritability, tiredness) (Hoeger, Turner, and Hafen 2002). There is some evidence that caffeine may be dangerous for fetuses and newborn children. In a 1985 study conducted by scientists of Carleton University, children born by mothers who had consumed more than 300 mg per day of caffeine were found to have, on the average, lower birth weight and head circumference than the children of mothers who had consumed little or no caffeine. In addition, use of large amounts of caffeine by the mother during pregnancy may cause problems with the heart rhythm of the fetus. For these reasons, some doctors recommend that a woman largely discontinue caffeine consumption during pregnancy and possibly also after birth until the newborn child is weaned. The negative effects of caffeine on the developing fetus can be attributed to the ability of caffeine to inhibit two DNA damage response proteins known as Ataxia-Telangiectasia Mutated (ATM) or ATM-Rad50 Related (ATR). These proteins control much of the cells' ability to stop the cell cycle in the presence of DNA damage, such as DNA single/double strand breaks and nucleotide dimerization. DNA damage can occur relatively frequently in actively dividing cells, such as those in the developing fetus. Caffeine is used in laboratory setting as an inhibitor to these proteins and it has been shown in a study (Lawson et al. 2004) that women who use caffeine during pregnancy have a higher likelihood of miscarriage than those who do not. Since the dosage rate of self-administration is difficult to control and the effects of caffeine on the fetus are related to random occurrence (DNA damage), a minimal toxic dose to the fetus has yet to be established. There has been extensive research on caffeine and this drug’s effect on the health of human beings. The Food and Drug Administration (FDA) concluded in 1958 that caffeine is recognized as safe for consumption. A recent review claims to have found no signs or evidence that caffeine’s use in carbonated beverages would produce unhealthy effects on the consumer. The American Medical Association (AMA) views caffeine as being safe for consumption. They state that those drinking moderate amounts of coffee and tea probably do not need to have concern for their health in regards to caffeine consumption (IFIC 2998). The minimum amount of caffeine needed to cause death to human beings is estimated to be 150-200 mg/kg of body weight. Symptoms of acute toxicity, including nausea, vomiting, diarrhea, cramps, and possibly seizures (Sauer 1994) may be observed after taking sublethal doses of caffeine. There have been some deaths from intentional overdosing on caffeine pills. Too much caffeine, especially over an extended period of time, can lead to a number of physical and mental conditions. The Diagnostic and Statistical Manual of Mental Disorders, Fourth Edition (DSM-IV) states: "The four caffeine-induced psychiatric disorders include caffeine intoxication, caffeine-induced anxiety disorder, caffeine-induced sleep disorder, and caffeine-related disorder not otherwise specified (NOS)." An overdose of caffeine can result in a state termed caffeine intoxication or caffeine poisoning. Its symptoms are both physiological and psychological. Symptoms of caffeine intoxication include: restlessness, nervousness, excitement, insomnia, flushed face, diuresis, muscle twitching, rambling, cardiac arrhythmia, tachycardia, and psychomotor agitation, gastrointestinal complaints, increased blood pressure, constricting of superficial blood vessels, sometimes resulting in cold hands or fingers, increased amounts of fatty acids in the blood, and an increased production of gastric acid. In extreme cases mania, depression, lapses in judgment, disorientation, loss of social inhibition, delusions, hallucinations and psychosis may occur (Medline Plus 2006). Caffeine-induced psychosis, whether it be delirium, manic depression, schizophrenia, or merely an anxiety syndrome, in most cases will be hard to differentiate from other organic or non-organic psychoses....The treatment for caffeine-induced psychosis is to withhold further caffeine." One study declared that "although infrequently diagnosed, caffeinism is thought to afflict as many as one person in ten of the population" (James and Stirling 1983). Caffeine increases the production of stomach acid and tends to relax the gastro-esophageal sphincter (Drug Facts and Comparisons 2001), which controls the passage of materials between the stomach and esophagus. High intake of caffeine over time can lead to peptic ulcers, erosive esophagitis, and gastroesophageal reflux disease (GERD). It is suggested that "slow metabolizers" who carry a variant of the enzyme cytochrome P450 1A2 (CYP1A2) have an increased risk of nonfatal myocardial infarction. Tolerance to caffeine occurs when individuals require higher doses to achieve the same level of stimulation. This effect can be demonstrated for blood pressure, heart rate, and the diuretic effect as well as an effect on the levels of renin, epinephrine, and norepinephrine. Tolerance is apparent usually after only a few days. Tolerance has also been demonstrated for certain subjective effects such as jitteriness, anxiety, nervousness, and tension. However, the existence of caffeine tolerance on the levels of alertness and the sleep cycle has been difficult to measure. When daily caffeine consumption is stopped, then a state of withdrawal begins. The symptoms may include headache, nausea, fatigue, drowsiness, anxiety, and irritability; in extreme cases symptoms may include depression, inability to concentrate, and diminished motivation to initiate or to complete daily tasks at home or at work. Withdrawal symptoms typically appear within 12 to 24 hours after stopping caffeine intake; then peak at 20 to 48 hours, and then last from one to five days. In extreme cases, withdrawal can begin in 3 to 6 hours and last for one week. Analgesics, such as aspirin, can relieve the pain symptoms. Currently, caffeine withdrawal is recognized as meriting further study by the DSM-IV and possible inclusion in the diagnostic list of International Classification of Diseases (ICD-10). Caffeine is easily absorbed when taken orally, with 99 percent absorption occurring within 15-120 minutes. A dose of 250 mg produces a peak plasma level of 5-25 micrograms per milliliter (ml). In order for caffeine to be effective, it must reach a plasma level of 6-13 micrograms/ml (Drug Facts and Comparisons 2001). After ingestion, caffeine has a physiological half-life in adults of three to seven hours, with much longer values in neonates and pregnant women (PharmGKB 2004). It is rapidly distributed to all body compartments and crosses the placenta and blood-brain barrier. Small amounts will also enter breast milk. Continued consumption of caffeine can lead to drug tolerance. Upon withdrawal, the body becomes oversensitive to adenosine, causing the blood pressure to drop dramatically, which leads to headaches and other symptoms. Each of these metabolites is further metabolized and then excreted in the urine, primarily as methylated urates and methylated xanthines. About one percent of caffeine enters the urine unchanged. It is believed that the main action of caffeine is to block adenosine receptors (A1 and A2a) on the surfaces of cells within the CNS. Adenosine is composed of adenine plus ribose, a five carbon sugar. Since the caffeine molecule is structurally similar to adenine, it is able to bind to adenosine receptors without activating them and thus prevent their activation by adenosine. Adenosine is a neuromodulator that modifies the release of neurotransmitters from nerve cells. When caffeine blocks adenosine receptors, the cells act as if the receptor is empty. This blocking of receptors has important secondary effects on many types of neurotransmitters such as acetylcholine, gamma amino butyric acid, serotonin, dopamine, and noradrenaline. Caffeine has also been shown to affect the turnover of several neurotransmitters including 5-hydroxytryptamine and dopamine (Fredholm 1999). It has been reported that caffeine acts as a competitive inhibitor of the enzyme cyclic AMP-phosphodiesterase. However, the levels of caffeine in blood required to produce an increase in blood pressure are well below those required for inhibition of cyclic AMP-phosphodiesterase (Chawla, et al. 2006). Therefore inhibition of this enzyme can not explain caffeine's therapeutic effects. The metabolites of caffeine may contribute to caffeine's effects. Theobromine dilates the blood vessels which increases the flow of blood and thus leads to an increase in the amount of oxygen and nutrient flow to the brain and muscles. Theophylline acts as a smooth muscle relaxant that chiefly affects the bronchioles and also acts to increase heart rate and efficiency. Paraxanthine or 1,7-dimethylxanthine, is responsible for the breakdown of triglycerides, which results in an increase in the release of glycerol and fatty acids into the blood (Dews et al. 1984). Caffeine increases the capacity for physical labor. A study conducted in 1979 showed a 7 percent increase in distance cycled over a period of two hours in subjects who consumed caffeine compared to control tests (Ivy, et al. 1979). Another study of trained runners showed a 44 percent increase in "race-pace" endurance, as well as a 51 percent increase in cycling endurance, after a dosage of 9 milligrams of caffeine per kilogram of body weight (Graham and Spriet 1991). Another group found that consumption of 5.5 milligrams of caffeine per kilogram of body mass resulted in subjects cycling 29 percent longer during high intensity circuits (Trice and Hayes 1995). Casal, S., M. B. P. P. Oliveira, M. R. Alves, and M. A. Ferreira. 2000. “Discriminate analysis of roasted coffee varieties for trigonelline, nicotinic acid and caffeine content.” Journal of Agricultural and Food Chemistry 48: 3420-3424. Chawla, J., A. Suleman, and N. Lorenzo. 2006. (http://www.emedicine.com/neuro/topic666.htm Neurologic effects of caffeine). Dews, P. B. 1984. Caffeine: Perspectives from Recent Research. Berlin: Springer-Verlag. Fredholm, B. B., K. Bättig, J. Holmén, A. Nehlig, and E. E. Zvartau. 1999. “Actions of caffeine in the brain with special reference to factors that contribute to its widespread use.” Pharmacological Reviews 51 (1): 83-133. Graham, T. E., and L. L. Spriet. 1991. “Performance and metabolic responses to a high caffeine dose during prolonged exercise.” Journal of Applied Physiology 71: 2292-2298. Hill,A. F. 1952. Economic Botany, second edition. New York: McGraw-Hill Book Co., Inc.
Ivy, J., D. Costill, W. Fink, et al. 1979. “Influence of caffeine and carbohydrate feedings on endurance performance.” Medical Science Sports Journal 11: 6-11. James, J. E., and K. P. Stirling. 1983. “Caffeine: A summary of some of the known and suspected deleterious habits of habitual use.” British Journal of Addiction 78: 251-58. Khokhar, S., and S. G. M. Magnusdottir. 2002. “Total phenol, catechin, and caffeine contents of teas commonly consumed in the United Kingdom.” Journal of Agricultural and Food Chemistry 50: 565-570. Koppelstaetter, F., C. Siedentopf, T. Poeppel, I. Haala, A. Ischebeck, F. Mottaghy, et. al. 2005. Influence of Caffeine Excess on Activation Patterns in Verbal Working Memory. Presentation on December 1, 2005 at the conference. RSNA 2005. Medline Plus. 2006. Caffeine Overdose. (Accessed August 26, 2006). Noever, R., J. Cronise, and R. A. Relwani. 1995. 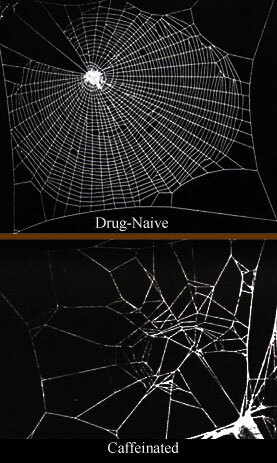 “Using spider-web patterns to determine toxicity.” NASA Tech Briefs 19 (4): 82. Pharmacogenetics and Pharmacogenomics Knowledge Base (PharmGKB). 2004. Caffeine. (Accessed August 25, 2006). PhytoMedical Technologies. 2006. Caffeine. (accessed August 26, 2006). Sauer, A. H. 1994. “Caffeine.” Clinical Toxicology Review 17 (2). Tarnopolsky, M. A. 1994. “Caffeine and endurance performances.” Sports Medicine 18 (2): 109 – 125. Tondo, L. and N. Rudas. 1991. “The course of a seasonal bipolar disorder influenced by caffeine.” Journal of Affective Disorders 22 (4): 249-251. Trice, I., and E. Haymes. 1995. “Effects of caffeine ingestion on exercise-induced changes during high intensity, intermittent exercise.” International Journal of Sports Nutrition 37-44. This page was last modified on 29 August 2008, at 13:27.